Expert tip #12: Poisons may be morally questionable, but they are very effective. You can twist space to your whim. Teleport: You can spend a standard action to teleport yourself and up to a heavy load to any place within Close range. Alternately, you may teleport a touched willing creature and their carried equipment instead of yourself. You may spend a spell point to increase your teleport range to Medium instead of Close. You must have line of sight to your destination. Bend Space: Talents marked (space) grant you ways of bending and folding space. Bending space requires a standard action, and you must be touching the target or location to be affected. When you spend a spell point to increase the range of your teleport, the range increases to Long instead of Medium. You may spend a spell point to perform a teleport as an immediate action. The range is decreased to 5 ft per 2 caster levels (minimum: 5 ft). If used to avoid an attack or area effect, this grants the target evasion and a dodge bonus to AC and Reflex saves equal to half your caster level (minimum 1). You cannot make a touch attack as part of this teleport, but you may affect another creature if you are already touching them. You may create a small pocket dimension, accessible through a shimmering portal that either appears in the air before you or on a touched, reasonably flat surface. This pocket dimension measures one 10-foot cube per caster level, arranged as you wish so long as the space is continuous. You can make the entrance as small as 5 ft square or as large as 10 ft square. You can select its light level and temperature (from -40° F to 120° F), but otherwise it is a featureless location. This space does not exist until you enter the portal, and continues to exists as long as you are inside. However, you may spend a spell point to create the space without entering, and allow it to remain for up to 1 round per caster level regardless of whether or not you are inside it. If the portal is placed on the ground or in some other way an unwilling creature might fall in, the creature is allowed a Reflex save to evade. Climbing the walls of this room requires a DC 20 Climb check. 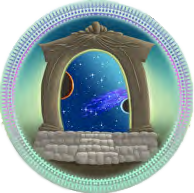 When this ability expires or is dispelled, all objects and creatures within this space are harmlessly ejected through the portal. You gain a permanent extradimensional space that may hold up to 10 pounds per caster level of non-living material. You can create a portal to this extradimensional space within arm’s reach at will. Placing an object in this space or calling an object from this space requires a full-round action, but may be done as a swift action by spending a spell point. Living things and attended objects cannot be placed in your extradimensional storage. If you die, all contents of your extradimensional space appear in your square or the nearest unoccupied space. You may spend a spell point to teleport multiple creatures, up to 1 additional target per 2 caster levels (minimum: 1). You may choose whether or not to include yourself in the group to be teleported. Each creature must be touching you or someone else in the affected group to be teleported, unless you possess the Ranged Teleport talent. If you possess the Unwilling Teleport talent, you only need to spend one spell point no matter how many unwilling targets are affected. If one unwilling target makes their saving throw, other creatures are still affected as normal. You may create a dimensional anchor emanating from yourself, affecting you and all creatures within 10 feet per caster level. You must concentrate each round to maintain this effect, although you may spend a spell point to allow the emanation to continue for 1 minute per caster level without concentration. Any attempt to teleport or cross planes made by any creature within this area fails unless they succeed at an MSB check against you. This also applies to the summoning of companions and other extraplanars. You may also touch a creature from another plane and spend a spell point to banish them back to their home plane (Will negates). When teleporting yourself or a group that includes yourself, you may spend an additional spell point to teleport as a move action instead of a standard action. You cannot make a free touch attack as part of a quick teleport, but you may affect another creature if you are already touching them. You no longer need to be touching another creature in order to teleport them, although the creature must still be within Close range to be affected in this manner. When teleporting a target (usually with the Teleport Object or Unwilling Teleport talents), you may splinter the target, causing it to appear not quite as it was. This deals 1d6 damage per 2 caster levels (minimum: 1d6) to the target. This damage bypasses all hardness, DR, and energy resistance. When teleporting yourself or another creature to a location already occupied by a different creature, you may send the creature already occupying that location back to where the teleporting creature came from. This must be a willing target unless you possess the Unwilling Teleport talent. If the second target is unwilling, you must spend a spell point and they are allowed a save as normal. If they succeed at this saving throw, the teleporting creature returns to their point of origin unharmed. You may designate a touched spot, object, or creature as a personal dimensional beacon, which lasts for one hour per caster level. You may spend a spell point to teleport yourself to your teleport beacon regardless of how far away it is, so long as it is on the same plane. If your teleport beacon is a creature or object, you may instead teleport your teleport beacon to you. You must use the Unwilling Teleport talent to do this with an unwilling creature, and they are allowed a saving throw as normal. You may teleport objects independent of people. The object cannot weigh more than 10 pounds per caster level, and it cannot be in the possession of another creature (in their hand or on their person). If a creature is willing, you may teleport the object directly into their hand or onto their person. If you possess the Ranged Teleport talent, you may, as a readied action, catch an projectile out of the air that passes within range, redirecting it against another target if you wish. The creature who initiated the attack is allowed a Will save to negate this effect, and you must make an attack roll against the new target, but using your casting abiity modifier in place of Dexterity when making the attack. Damage is still determined by the creature who initiated the attack. You may lay a teleport effect onto an adjacent, unoccupied 5 ft square. If you possess the Ranged Teleport talent, you may place this effect anywhere within that range. This is a latent teleport effect, except it only activates when a creature steps onto the target square, and must target the triggering creature. You must possess the Unwilling Teleport talent and spend a spell point as usual if you want your teleport trap to affect unwilling targets. You must possess the Teleport Object talent to affect unattended objects, and may decide when making the teleport trap whether unattended objects will trigger the effect or not. If you possess the Group Teleport talent, you may spend a spell point to allow the teleport trap to remain after its initial use, affecting additional creatures who enter its square until the duration expires or it has attempted to teleport 1 creature + 1 per 2 caster levels (minimum: 2 total). You must designate the destination where triggering creatures will be teleported when creating a teleport trap. When a creature steps into the triggering square, the teleport effect activates, transporting the triggering creature to the designated destination. Unwilling targets are allowed a saving throw as normal. A teleport trap lasts for 10 minutes per caster level before becoming inert. This is a magical trap with a Perception DC and Disable Device DC equal to the teleport’s save DC. You may only have one teleport trap active at a time. You may select this talent multiple times. Each time this talent is gained beyond the 1st, increase the total number of teleport traps you may have active at one time by 1. You may spend an additional spell point when making a teleport to no longer require line of sight to the location; instead of choosing a spot to appear, you may instead indicate a direction and distance. If the target arrives in a place that is already occupied by a solid body, you may spend a spell point to return the target to its point of origin unharmed. Otherwise, the target takes 1d6 points of damage and is shunted to a random open space on a suitable surface within 100 feet of the intended location. If there is no free space within 100 feet, the target takes an additional 2d6 points of damage and is shunted to a free space within 1,000 feet. If there is no free space within 1,000 feet, the target takes an additional 4d6 points of damage and the teleport simply fails. You may spend a spell point to teleport an unwilling creature as you can a willing creature. You must succeed at a melee touch attack (made as part of the standard action required to use teleport) against the target, and the unwilling creature is allowed a Will saving throw to negate being teleported. An unwilling creature can only be teleported into open areas on solid surfaces (thus, they can’t be teleported into the air or into a solid object, and any such attempt instantly fails). In addition, they gain a +4 bonus to their saving throw if the location would be directly harmful to them (onto a bed of spikes, etc. ).